Ms. Raff graduated from Boston University with a Bachelor of Business Administration degree and from Drexel University with a Masters of Business Administration. She is widely recognized throughout the retail industry as an outstanding merchant and strong multi-store retail executive. Previously, she served as J.C. Penney’s Executive Vice President, General Merchandise Manager for the Fine Jewelry Division. During her service at J.C. Penney, she was the first general manager to ever receive the J.C. Penney Chairman’s Award, the company’s highest tribute to managerial excellence – an honor she received multiple times during her service there. Prior to joining the J.C. Penney organization, Beryl served as Chairman and CEO of Zale Corporation. In her six years at Zales, she held positions of increasing responsibility, including executive vice president and chief operating officer, president and chief operating officer, and president and chief executive officer. She began her career with R. H. Macy & Company in 1975 as an executive trainee. During her 19 years with the Macy organization, she moved steadily upward, holding positions as buyer, merchandise manager and store manager. In 1983, she became divisional merchandise manager for costume and bridge jewelry, and then held positions as vice president and divisional merchandise manager for fine jewelry, group vice president for costume, bridge and fine jewelry, and finally senior vice president and general merchandise manager for Macy’s East bridge and fine jewelry and lingerie. In 1999, the Women’s Jewelry Association named her to its Lifetime Hall of Fame and in 2002 the American ORT Jewelry Industry presented her with their Community Achievement Award. Beryl is the 1999 and 2006 recipient of the UJA – Federation of NY – Diamond, Jewelry and Watch Division’s “Leadership Award of Excellence.” In 2009 Beryl was inducted into National Jeweler’s Retailer Hall of Fame in the majors category. Beryl serves on the board of Group 1 Automotive, a Fortune 500 company; and the National Association of Corporate Directors (Heartland Chapter). She also served on the board of JoAnn Stores for 10 years until the company was taken private. Beryl is active within the jewelry industry serving on the executive board of The Jewelers Vigilance Committee, and the advisory board for Jewelers’ Circular Keystone. Under her leadership, Helzberg has focused its philanthropic efforts on the Make A Wish Foundation. 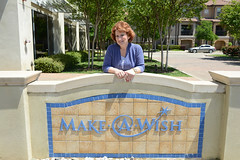 Beryl is honored to be a member of the national board of Make A Wish Foundation. Beryl and her late husband, Barry, have one child, Edward. Thank you for reviewing my bio and being a Helzberg Diamonds valued customer. When Beryl Raff looks back on her journey, it seems surreal at times. She still thinks, "How did all of that happen?" New York--Beryl Raff, Howard Hauben and three members of the Bromberg family were honored Tuesday night at the American Gem Society’s 12th annual Circle of Distinction dinner, held at the Plaza Hotel.